Danji restaurant: Modern Korean food. All you need to know is two words: bulgogi sliders. Hungry for the latest and greatest restaurants that New York has to offer? Look no further. We spoke with New York restaurant reviewer and co-founder of The Infatuation, Andrew Steinthal for his most beloved NYC eateries. A new sit-down restaurant from these legendary smoked fish purveyors. Eating something from Russ & Daughters is a must, and unlike the original store up the street, here you can eat at a table. The perfect place to lap up practical breakfast while people watching some of New York’s coolest looking folk. Just don’t expect them to be up before 11am. Behind a red velvet curtain in this high-end hotel lobby lies one of New York City’s best burgers. It’s a big call, yes, but you have to eat one of these burgers before leaving Midtown. The uptown location of our favorite Japanese restaurant import, here you can eat all the ramen you can possibly stand. Cookshop does some of the best brunches and lunches in town, and it’s conveniently located next door to The Standard High Line hotel. Modern Korean food. 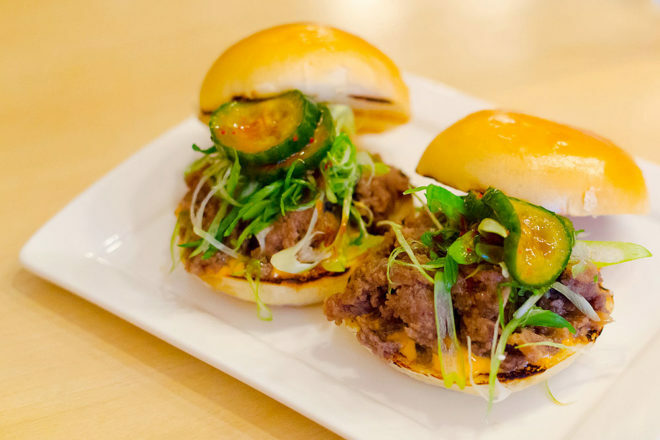 All you need to know is two words: bulgogi sliders. If you leave without getting a slice from Joe’s, New York can’t allow you back. It’s in their city charter. The original East Village location of a fast-growing lobster roll empire. Even if you happen to be visiting from Maine, you need to eat one of these bad boys. You will be instantly more likable and respected by your friends and coworkers after wining and dining at Il Buco. Show up, sit at the bar, eat pasta, eat olive oil cake, repeat. L’Artusi has excellent food and the best vibe ever. No wonder it’s a favourite among New York locals. Here’s how the greatest day in Brooklyn works – you start on a Saturday at about 4pm, walk across the Brooklyn Bridge into Dumbo, continue on to Vinegar Hill House, eat delicious food, then send us a thank you email for planning the greatest day ever. If ever you were going to venture over to Greenpoint, this is where we’d tell you to eat. Paulie Gee’s has some of the best and most creative pizzas in the city, and Paulie himself will be walking around talking to customers. At the very least you can tell your friends that you’ve heard of it. That’s pretty cool too. If we were going to tell you to have one meal on your first trip to New York City, this would be it. We’d also tell you to have it at 2am. Blue Ribbon is open until 4. Another classic that we still have in heavy rotation, after all these years. David Chang’s Korean food empire started here, and it’s still putting out amazing food. Not only is this one of New York’s best restaurants, it’s one of the city’s best hangouts. Put your name in with the host and head up to the bar on the second floor for some drinks and action until your table is ready. Or maybe just skip eating altogether and see where the night takes you.